Can Xilinx and Altera Grab This Enormous Opportunity? Will technological changes create a ten-fold increase in the market that chip makers Xilinx and Altera can address? The programmable logic device, or PLD, market is currently worth an estimated $4.5 billion. However, major PLD players Xilinx (NASDAQ:XLNX) and Altera (UNKNOWN:ALTR.DL) claim that due to technological changes, PLDs could soon take almost $50 billion away from the much larger application-specific integrated circuits and application-specific standard products -- ASICs and ASSPs, respectively. Are PLD makers really about to receive such a huge windfall in terms of new business? ASICs and ASSPs are chips that are produced for the needs of a particular customer or application. They offer the benefit of good performance, as well as low per-unit cost past a certain scale of production. However, they require a good deal of investment up front, as the design must be perfected before the chips can go into production. On the other hand, PLDs are general-purpose integrated circuits that can be programmed through software. In theory, this gives them the best of both worlds, with the performance of a chip and the configurability and lower investment cost of software. In reality, PLDs have historically required a larger die to provide the flexibility of being programmable, and this caused both greater cost and power consumption relative to ASICs and ASSPs. But PLD makers argue that's changing, since PLDs are increasingly produced using newer technological processes that are often impractically expensive for one-off ASIC and ASSP products. In other words, PLDs are becoming cheaper and more efficient, which makes them competitive with ASICs and ASSPs in an increasing number of applications. The production process difference between PLDs and ASICs. Source: Altera. The logic above sounds convincing, and there is certainly anecdotal evidence that this change is occurring. Both Xilinx and Altera have mentioned some clients, particularly in the wireless and networking space, who used to develop ASICs for their applications, but are now finding that the newest PLDs better meet their needs. Still, considering that Xilinx and Altera have tens of thousands of customers each, it's perhaps inevitable to find supporting cases. Importantly, the replacements go the other way also, since ASICs remain more cost-effective for large-volume productions. In particular, Huawei, Altera's biggest customer, made a switch in 2012 from using PLDs exclusively to also using ASICs, a move that is estimated to have cost Altera $150 million in 2013, almost 10% of the company's revenue for the year. Finally, ASIC and ASSP providers seem to be doing well on their own. Broadcom (UNKNOWN:BRCM.DL), which has been competing with Xilinx and Altera for base-station business in the China LTE rollout, has seen 12% growth in its infrastructure and networking division last year, and expects to see more growth in the coming quarters. Looking at the revenue comparison over the past five years, it's clear that Xilinx and Altera remain minor players compared to ASIC and ASSP powerhouses such as Broadcom and Texas Instruments. 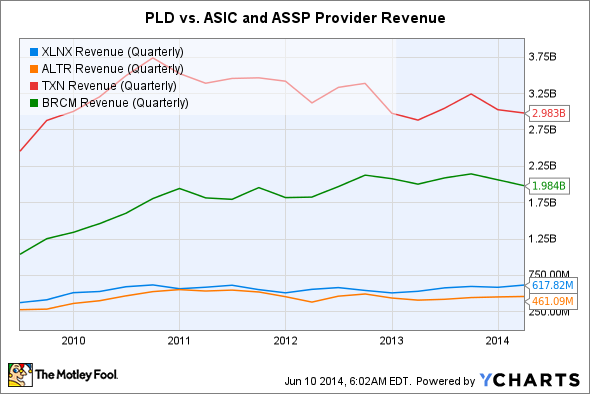 PLD providers have been claiming for a long time -- at least since 2009 -- that the tipping point for PLDs is here. They might be right that the PLD revolution is coming eventually, but don't hold your breath. Even if the newest generation of PLDs turns out to be a viable replacement for a vast number of ASIC and ASSP applications, the nature of the market means that it will likely take years until prototypes and proofs of concept ramp up to profitable volume production. The good news for investors is that this is a change that might be visible from far away. Xilinx and Altera are certain to be vocal about any major design wins that they will achieve, even though this won't translate to significant revenue increases for years. On the other hand, if you're an investor in Broadcom, there's no need to worry, at least yet.